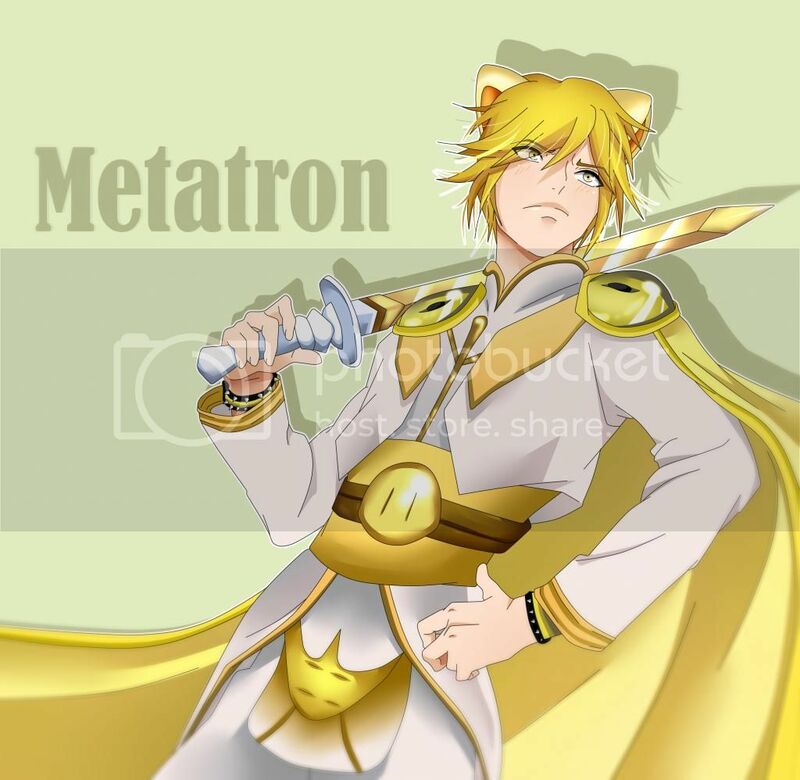 Listing would be estimated stats for specific attributes that is more likely to be used for the pet due to it's stats @ level 50, 100, 150, 180 and 199. Wind Shark - 91AGI/269SPD @50, 141AGI/464SPD @100, 191AGI/659SPD @150, 221AGI/776SPD @ 180, 240AGI/850SPD @199. 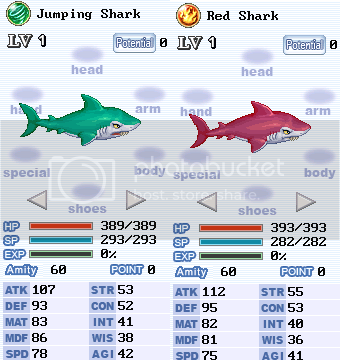 Fire Shark - 104STR/308ATK @50, 154STR/508ATK @ 100, 204STR/708ATK @ 150, 234STR/828ATK @180, 253STR/904ATK @199. Wind Parrot - 89AGI/265SPD @50, 139AGI/460SPD @100, 189AGI/655SPD @150, 219AGI/772SPD @180, 238AGI/846SPD @199. 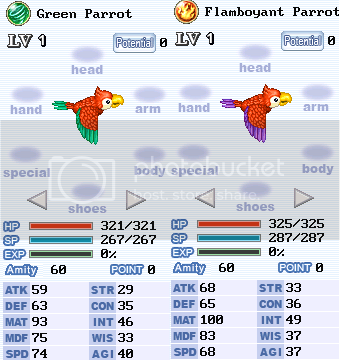 Fire Parrot - 98INT/276MATK @50, 148INT/456MATK @100, 198INT/636MATK @150, 228INT/744MATK @180, 247INT/812MATK @199. 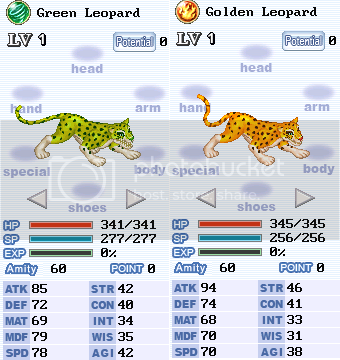 Wind Leopard - 91AGI/269SPD @50, 141AGI/464SPD @100, 191AGI/659SPD @150, 221AGI/776SPD @ 180, 240AGI/850SPD @199. Fire Leopard - 95STR/290ATK @50, 145STR/490ATK @100, 195STR/690ATK @150, 225STR/810ATK @180, 244STR/884ATK @199. Fire Flower - 74STR/248ATK|74INT/228MATK @50, 124STR/448ATK|124INT/408MATK @100, 174STR/648ATK|174INT/588MATK @150, 204STR/768ATK|204INT/696MATK @180, 223STR/844ATK|223INT/764MATK @199. Water/Earth Flower - 69AGI/204SPD @50, 119AGI/374SPD @100, 169AGI/544SPD @150, 199AGI/646SPD @180, 218AGI/711SPD @199. Wind Flower - 71AGI/233SPD @50, 121AGI/428SPD @100, 171AGI/623SPD @150, 201AGI/740SPD @180, 220AGI/811SPD @199. Wind Wolf - 79AGI/247SPD @50, 129AGI/442SPD @100, 179AGI/637SPD @150, 209AGI/754SPD @180, 228AGI/828SPD @199. Now to move to IM pets, I've not been able to verify that the stats are correct since I used IGG's events as areas to take pictures from. Unicorn - 92AGI/271SPD @50, 142AGI/466SPD @100, 192AGI/661SPD @150, 222AGI/778SPD @180, 241AGI/852SPD @199.
Pegasus - 96AGI/278SPD @50, 146AGI/473SPD @100, 196AGI/668SPD @150, 226AGI/785SPD @180, 247AGI/863SPD @199. Kirin - 85AGI/258SPD @50, 135AGI/453SPD @100, 185AGI/648SPD @150, 215AGI/765SPD @180, 234AGI/839SPD @199. Combat Tiger - 109STR/318ATK @50, 159STR/518ATK @100, 209STR/718ATK @150, 239STR/838ATK @180, 258STR/914ATK @199. Crazy Dragon - 86STR/272ATK|88INT/256MATK @50, 136STR/472ATK|138INT/436MATK @100, 186STR/672ATK|188INT/616MATK @150, 216STR/792ATK|218INT/724MATK @180, 235STR/868ATK|237INT/792MATK @199. Mystic Tiger - 110INT/300MATK @50, 160INT/480MATK @100, 210INT/660MATK @150, 240INT/768MATK @180, 259INT/836MATK @199. Orachi- 103INT/276MATK @50, 153INT/446MATK @100, 203INT/616MATK @150, 233INT/718MATK @180, 252INT/783MATK @199. Phoenix- 85INT/250MATK|86AGI/235SPD @50, 135INT/430MATK|136AGI/405SPD @100, 185INT/610MATK|186AGI/575SPD @150, 215INT/718MATK|216AGI/677SPD @180, 234INT/786MATK|235AGI/741SPD @199. Ghost War Horse - 90STR/250ATK|84AGI/231SPD @50, 140STR/420ATK|134AGI/401SPD @100, 190STR/590ATK|184AGI/571SPD @150, 220STR/692ATK|214AGI/673SPD @180, 239STR/757ATK|233AGI/738SPD @199. Naughty Dolphin - 87STR/244ATK|79AGI/222SPD @50, 137STR/414ATK|129AGI/392SPD @100, 187STR/584ATK|179AGI/562SPD @150, 170STR/686ATK|209AGI/664SPD @180, 236STR/751ATK|228AGI/729SPD @199. 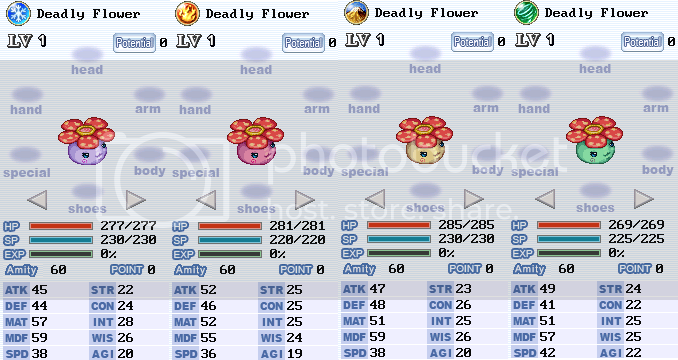 If anyone could get a level 1 picture of a Sky Dragon, Iron Dino, Cerberus and IM Deadly Flower's stats, that'd be awesomesauce!